I don’t usually do reviews, as you might know, but….this had me intrigued. And when I saw how useful these things are I had to share. So let’s do this! I’m reviewing primarily the set (listed in the supplies) but also a few other sharpeners, and the case I’m taking with me to Juneau today. Yay for a weekend away, eh! Watch the video below or click HERE to see it in HD on YouTube. 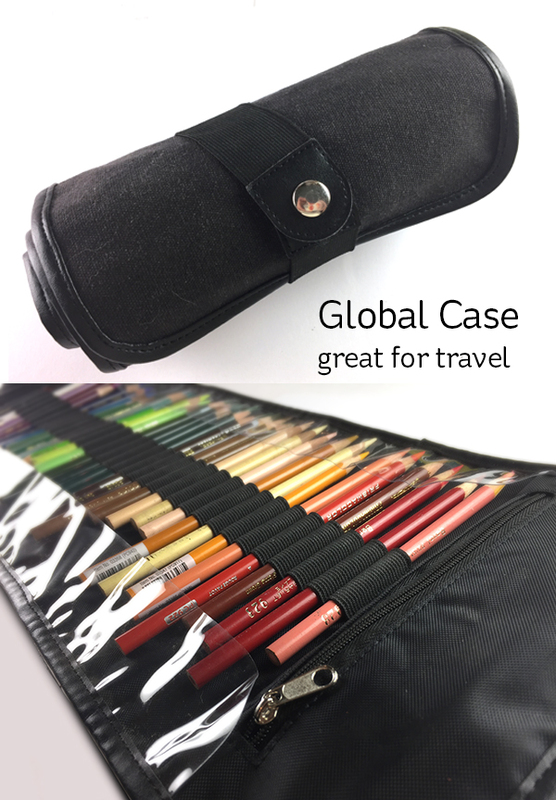 Here’s the case I’m using for travel. Pencils all sharpened up and ready to roll! 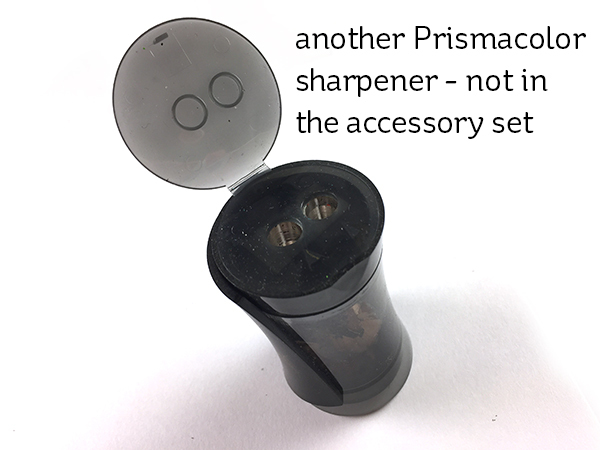 This is another handheld sharpener that’s awesome – if you don’t have something to collect your shavings into. 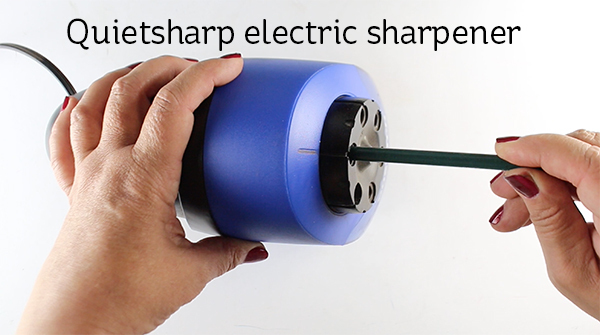 And of course….the big mama sharpener. I came to this blog searching for insight on using just the oil shavings from my polychromos with OMS. Do you have any experience with that or using powder blender before? I’m trying to tint the colors when I solvent blend my oil based pencils…any tips to get that effect would be appreciated! Thanks for the info. I can’t believe you never heard of the blender pencil. Mine came with a set of colored pencils but it was years ago and I don’t remember how big the set was. Also, in school we used Prismacolor markers because they were cheaper than Copics and we used the blender as a blender, unlike the Copics. Have you tried the Dove blender pen? I have one but I haven’t tried it yet. Thanks for keeping us informed with interesting things and special thanks for sharing your talents. I love to see your videos. Love that blender pen idea for on the go! Can’t take my odourless solvent on the plane and it’s awkward in waiting rooms. 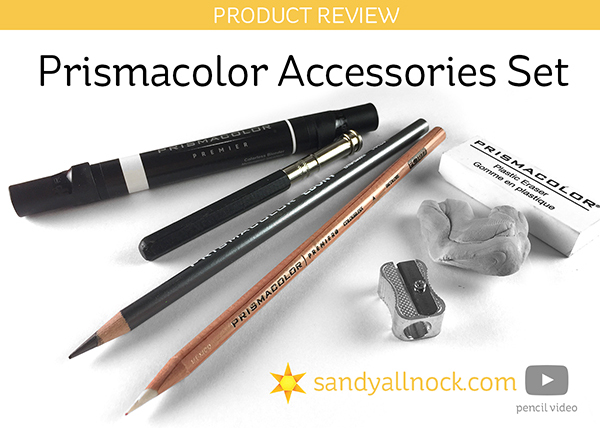 I have the colourless pencil for blending and it’s great for most projects but does leave a bit more shine. I had forgotten about the pencil holders. People used to use them years ago for normal pencils when they cared about frugality. I must pick one up. Thanks so much for the review! Thanks for your review. I was only shocked to see that Gamsol cost 9 Dollar for a bottle of 120 ml. A lot of people use in the Netherlands odorless turpentine for blending and that cost 3 to 6 dollar voor 1 liter (1000 ml). Whe buy that in our version of Home Depot. It works the same. Thanks for the review Sandy…I can’t believe I knew something you did not – LOL! I have a couple of the extenders and yes, they are wonderful when you get down to the ends of your pencils! You are a delight and I soooo enjoy all your videos!